Readers be forewarned: My brief hiatus from blogging is now over. (Been busy with work.) Let the posts commence! 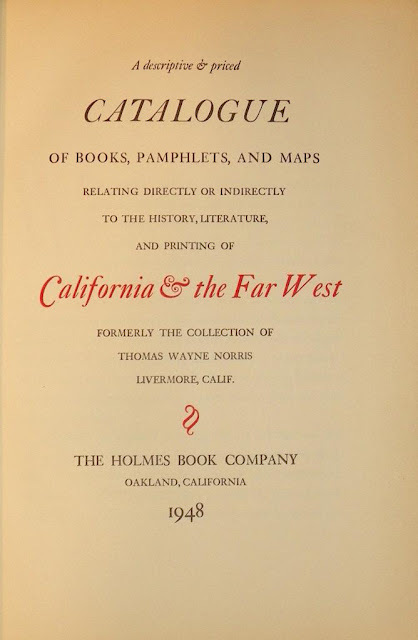 My friend John Payne, bookman, appraiser, and bibliographer of Steinbeck and W. H. Hudson, is currently working on a book entitled Great Catalogs by Master Booksellers. The manuscript is in draft form and John has asked for feedback from a number of noted booksellers and book people to finalize the 100 or so catalogs that will be featured. The catalogs will encompass 19th & 20th century examples in English. Of course, any list is subjective, but a primary thrust is to highlight great booksellers and their catalogs in a way never done before. This will draw attention to the whole subject and provide a foundational reference for further study. John was gracious enough to ask me to write an introduction. I've been chipping away at it and recently finished. The intro as it will appear in the book will focus mainly on historical context. However, I've also penned some personal reflections on bookseller catalogs that I'm posting now for your enjoyment and edification. I'm highlighting a few interesting bookseller catalogs from my own collection, too. If you have any favorite bookseller catalogs that you feel would be candidates for the book please let me know and I'll pass them on to John. I will keep you posted on publication as well. This will be an important reference and fine read! Bookseller catalogs fascinated me early and often. As a budding collector in the pre-Internet days (late 1980s) they taught me much and quickly deflated my meager book budget—repeatedly. My first exposure to catalogs was a heady one and got me in a bit of trouble. This occurred shortly after I garnered a graduate student internship at the Harry Ransom Center, The University of Texas—Austin. The Center is one of the great rare book libraries in the country. The director, Thomas F. Staley, took a chance on my enthusiasm and bookish interests and allowed me to mentor with him in acquisitions. Staley’s office was inundated with bookseller catalogs. The cardinal rule was he looked at them first before they were passed on to others. 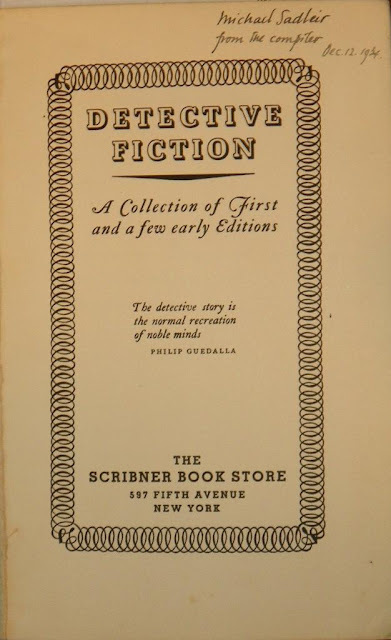 His bookman’s eye scanned the catalogs for choice items for the library and occasionally a Joyce book for his formidable private collection. Well, I grew impatient one day, gazing upon a fresh stack sitting in his inbox, he not yet arrived. It would only take a few minutes, I thought, and I borrowed them and took them to my cubicle close-by. An hour later, I was still buried in the catalogs, pencil in hand, sponging up all sorts of knowledge when I heard an irritated shout by Staley to his secretary. Where were his catalogs? Uh-oh. I high-tailed it to his inbox with catalogs in hand and found him waiting there to greet me. After a stern look and an admonishment to stick to the regular game plan, he smiled with a twinkle in his eye and asked if I’d seen anything the library might want. Kindred spirits. I still get a tingle when I have a fresh catalog in hand—a stirring of excitement of what may lie within and a tangible connection to a bookseller. I was exposed in my perusing to booksellers who have made John Payne’s list such as H. P. Kraus (New York), Maggs (London), Quartich (London), and William Reese (New Haven, CT). 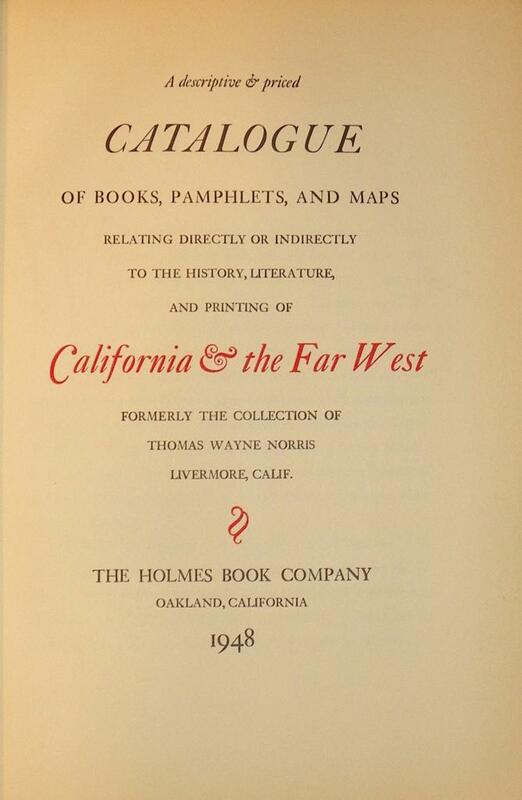 Creating a “great”catalog list such as this is of course subjective, but so is every similar list generated, whether it is One Hundred Books Famous in English Literature (The Grolier Club, 1902), or The Zamorano 80: A Selection of Distinguished California Books (The Zamorano Club, 1945). The success of such an endeavor in my mind is whether or not the work serves as a valuable reference, stirs long-term interest in the subject, and also provides a coherent framework to discuss and build upon. This work goes one step further and illuminates an area of bibliography that surprisingly has been neglected. Bookseller catalogs, as much as auction catalogs, have been the bedrock of the book trade. They are a primary source of history for the many booksellers who never put formal recollections to paper. The bookseller oversees all aspects of the catalog from the highly personal selection of items to be included, the research and writing of the descriptions, the catalog production itself, the marketing to clients, and then (hopefully) the sales. I’m fortunate to have participated in the compilation of quality bookseller catalogs. Shortly after college, I worked as the assistant to a long-time dealer in Western Americana, Texana, and Latin Americana. The catalogs were thoroughly researched, with tedious proofing and rewriting, and high production values. Every dealer has their own way of doing things but an account of my cataloging experience will mirror in many aspects what is involved. The books in this instance were acquired from a single collector who at age 90 plus had been collecting Texas material for over sixty years. He was still spry for his vintage but figured he better sell his collection soon so that his family wouldn’t have to deal with it. Over one hundred boxes arrived at the dealer’s house—there was no open shop which is typical of many dealers—and soon they were stacked everywhere, living room, dining room, extra bedroom, battling for space with other collections and the “immoveable object”, an immense reference library of thousands of volumes. I was in awe of this research collection but later learned a number of the established booksellers maintained such vast reference material on hand. These books are their working tools and sometimes their outlet for a latent collecting urge. A good bookseller can perform miraculous feats of memory utilizing this resource. The internet has fundamentally changed research but a good reference library is still an essential tool. Much information is not online and may never be. The books were sorted and examined. The summer heat was upon us and the AC groaned and we sweated a bit as I handed over the first stack to be cataloged. The collection contained many Texas highlights but also much obscure and unusual ephemera. I was sent scurrying for different reference books and they soon littered the workspace. Titles that had previously passed through the dealer’s hands were on file and these records were pulled to save time, the particulars of the new copy examined and described. 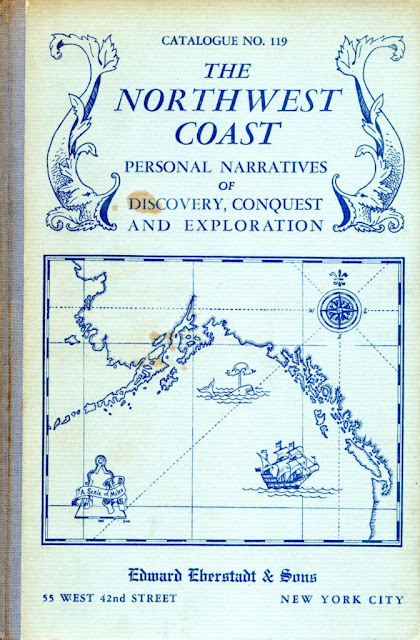 This research is the fun part for most booksellers along with the hunt itself--a surprising provenance found, a rare item previously unrecorded, a great item in stunning condition, all providing various levels of book thrills. Then, perhaps the most difficult job of all: the pricing of each item. 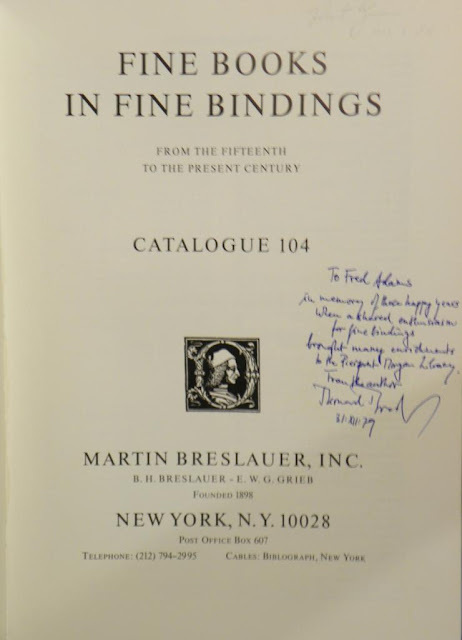 Auction and bookseller catalogs were consulted with varying success. The feel and condition of an item is so important, the dealer’s experience and knowledge of their client base critical, and in the end for the most challenging cases, the virtual dart board pricing game. This continued for a Biblical forty days with no time off. Money was tight, expenses needed to be recouped, and reserves for the catalog expenses dwindled so we ate rice and beans for lunch all too frequently. To me this was a grand adventure but the dealer was stressed, caught between the desire for the highest quality production and necessary expedience. A professional photographer was brought in to photograph featured items and a local printer hired. We proofed that catalog and proofed, and proofed, and an index was included. Finally, all went to the printer. Shortly thereafter it was ready, five hundred copies printed on good paper bound in stiff wrappers, over a thousand items meticulously described. The baby had been birthed! Although I was more of a nephew or cousin rather than a parental unit, I swelled with pride at the accomplishment. Advance copies were sent to the best customers and institutions. The rest were mailed shortly after. A nervous few days followed. Success was mercifully quick—not always the case--and orders remained steady as much of the material found new homes. Positive feedback was received about the catalog itself adding another layer of success. Such are some of the stresses and glories of catalog compilation. 1934. Groundbreaking effort by John Carter who collected and cataloged the material. This copy inscribed to his mentor, Michael Sadleir. 1948. 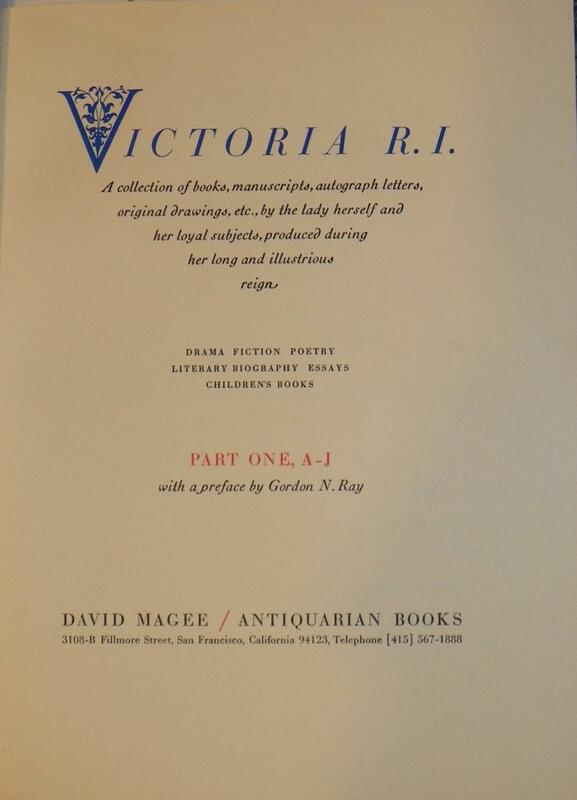 Printed by the Grabhorn Press. A rare presentation copy from Holmes, inscribed to Dr. Harry W. Plath, who purchased many of the best books in the catalog.